BrainGate investigator John Simeral awarded grant to support benchtop testing of wireless brain sensor. Professor Krishna Shenoy named a Howard Hughes Medical Institute Investigator. BrainGate team awarded $1-million prize at BrainTech Israel 2013. BrainGate research named one of the Top 10 Clinical Research Achievements of 2012 by the Clinical Research Forum and awarded the Herbert Pardes Clinical Research Excellence Award as the most outstanding nominated project. Case Western Reserve University added as BrainGate2 clinical site. New paper demonstrating use of BrainGate to control robotic arms. Stanford University joins BrainGate Research Team as a clinical site. Science News and Notes, “Advances in Neuroscience Raise Medical Hopes, Social Questions”. New paper demonstrating use of BrainGate at 1000 days. NIDCD Featured Story: Giving Voice to Thoughts: NIDCD-funded research helps the locked-in communicate again by turning thoughts into words. John Donoghue’s Charlie Rose video appearance. We’ve updated the information about our clinical trial. 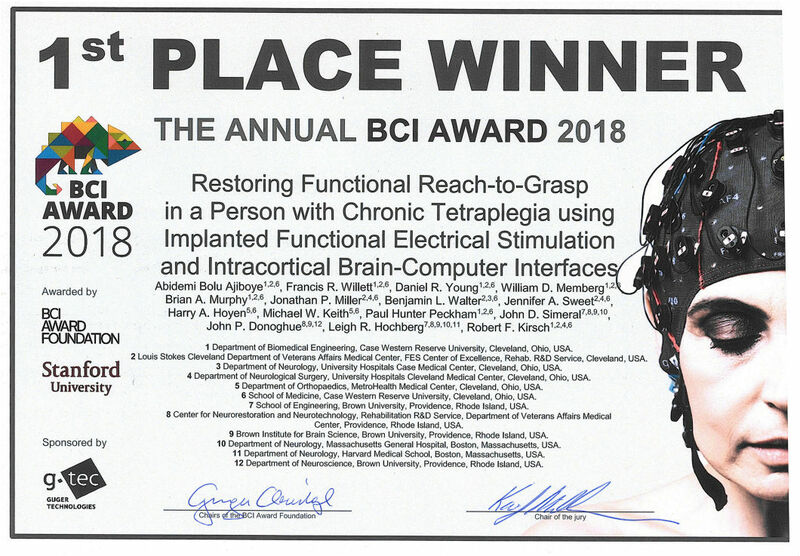 We are happy to report that the pilot clinical trial of the BrainGate2 Neural Interface System has started, and is now recruiting participants. More information will appear here over the next few weeks.